This post is a mixture of facts, delusions and opinions. The three generals namely Major General (R) Ameer Faisal Alavi, General (R) Muhammad Yusaf Khan and General Tariq Majeed were sources of some delusions in both of my psychotic phases. One has been murdered mysteriously, one is retired and one is still serving. I had the chance of seeing all the three generals once during my Army career. The associated delusions were all based on some facts and little incidents that I will narrate. In fact some officers mentioned their names on and off with me and I thought that they all had something to do with the PMA incident and subsequent recovery of list of officers from SM Farman, the Indian spy. I mentioned the PMA incident in this post and developed two theories on it here and here. I thought the Army developed some sort of clear grouping after that. I visualized that some sort of a tussle was going on between good and bad elements within the Army. 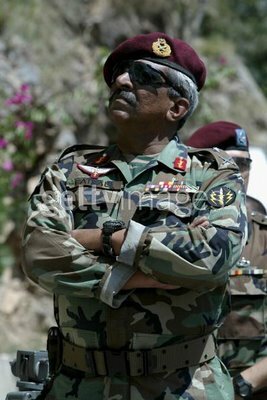 Major General (R) Ameer Faisal Alavi was the first General Officer Commanding of the elite Special Service Group (SSG) of Pakistan Army. He renounced his British nationality to join Pakistan Army. He was also the first Pakistan Army officer, who captained the Armed Forces Skydiving Team (AFST) as a General Officer on 23 March, 2005. I had the chance of seeing him in 2001 in EME College when I was doing my Basic Course. He came to recruit officers for SSG as it was being opened to technical arms too. I was unaware of the PMA incident then. In 2004, I came to know the PMA incident through a fellow officer. In 2005, I developed various delusions/theories around him. I thought he knew me via PMA incident but was unaware that a list was also recovered. I thought his gesture of coming to EME College, where I was studying, was an open warning to bad elements in Army. I also developed a delusion that there was going to be a battle between commandos loyal to him and that of General Pervez Musharraf and both will be at right. I saw it as a fulfillment of a prophecy of one hadith of Holy Prophet Muhammad (PBUH). In fact, in those same days, I read a review of the book on SSG in daily DAWN. Its foreword was written by both Pervez Musharraf and Faisal Alavi Gradually I came upon the conclusion that Maj Gen Faisal Alavi represented good and Gen Pervez Musharraf represented evil forces. Later in 2009, I came to know that he was sacked by Gen Musharraf in same month I was unwillingly admitted in hospital. He made remarks considered disrespectful to Gen Musharraf and he was sacked for ‘conduct unbecoming’. On 19 November 2008, while driving to work in his car in Islamabad, he was shot dead by unknown gunmen. I was doing MS at that time. I thought it to be a direct warning to me by bad elements in Army. After his death he was described by his daughter as an “easy going, humble, compassionate, but very fearless” person. General (R) Muhammad Yusaf Khan was perhaps the most charismatic general in my list. He served as the Vice Chief of Army Staff (VCOAS) from October 8, 2001 until October 7, 2004. I saw him once when he come to offer funeral prayers at Qasim Aviation Base, Rawalpindi of some officers and men, martyred in helicopter crash in 2004. I have one firm belief about him. He had access to the list of officers recovered from Indian spy and used it. Only a categorical denial by him can offset me from this unshakable belief! Gen Muhammad Yusaf Khan served as Military Secretary (MS) in 1998. MS Branch is responsible for postings and career management of officers. In 2003, an officer who had earlier worked with Gen Yusaf Khan in MS Branch told the following thing, “When Gen Yusaf was MS, he used to throw files on faces of officers in anger.” In 2004 I came to know about the PMA incident specifically the list of officers. In 2005, I combined these two things in some way to draw the far reaching conclusion that Gen Yusaf had access to the list. I again want to emphasize that the list is not an invention of my mind. I thought that the fore mentioned statement was an indirect way of saying on part of Gen Yusaf, “Yes, I had the list and I have used it.” I thought he was stunned by the volume and implications of the information in the list. The list must have identified both the good and bad officers. It must have indetified each officer in the eyes of ‘enemy’. I also believed that there might have been some name pattern i.e. good and bad names in the list. Specifically I believed that Gen Pervez Musharraf was kept in dark about the contents of the list. The name Pervez was one of the bad names in my list and Yusaf was a good one. I thought that the ‘list’ part of the PMA incident remained secret up till that point and Gen Musharraf came to know about it indirectly but could not do anything. I thought that this might have given Gen Musharraf some sleepless nights! 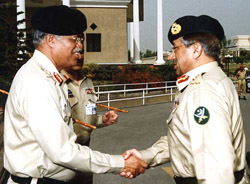 This way, Gen Yusaf indirectly made sure that he did not get extension as VCOAS from Gen Musharraf. Moreover Gen Musharraf decided to stick to his uniform for a few more years. I thought that Gen Yusaf must have realized that not only the bad officers were at good positions but also were closely knitted and exploiting good officers for their own advantage. I thought that in all those years Gen Yusaf took care of good officers especially from the list. I thought that he started the uphill task of organizing the good officers in Army and exposing the bad officers and their so called network. I think this task is still going on! In fact I came close to asking one of my friends to make a sketch of Gen Yusaf and hang it in his room and remove that of Gen Pervez Musharraf. In 2009, in my second psychotic phase, my relations with my younger brother soured very much. I asked my uncle to meditate. During conversations I took the name of Gen Yusaf Khan in context of India Spy and the list of officers recovered by him. On this my uncle remarked, “Gen Yusaf koi khudda thorri hai.” meaning “Gen Yusaf is not God.” But I think I had made him a god. This incident was followed by two related developments. On 4 December 2009, militants launched deadly attack on Parade Lane mosque near army headquarters Rawalpindi. Gen (R) Yusaf was among the injured. I thought for a while that Gen Yusaf was an indirect target. Then I had a very different and clear dream about him. In dream I had a conversation with a senior officer from 94th PMA Long Course. He told me that SM Farman (the Indian spy) became AWOL (absent without leave) before their passing out .i.e. after mine and that the list of officers was in possession of Gen Muhammad Yusaf Khan. Someone who knows can confirm the AWOL part of my dream. The Gen Yusaf part can only be confirmed by him. The only option is that someone from our media would pick this post up and ask from Gen Yusaf head on! General Tariq Majeed is the current Chairman Joints Chiefs of Staff Committee (CJCSC). I saw him when I was in my first psychotic phase in 2005. He had come to 503 Aviation Base Workshop to attend an official ceremony. He was then the Chief of General Staff (CGS). The delusions I developed around him were a mixture of delusions I developed around Maj Gen (R) Faisal Alavi and Gen (R) Muhammad Yusaf Khan. I thought that he knew me via PMA incident and was monitoring developments around me. In 2005, during my first psychotic phase, Gen Yusaf had retired and Gen Tariq Majeed was serving as CGS. I thought that he carried the baton after the retirement of Gen Yusaf Khan. Specifically I believed that he was aware that a list of officers was recovered from the Indian spy and might be knowing some of its features if not using it. I believed that he was using more of his own judgment than referring to the list to expose the bad elements in Army. It was widely held that he, in his capacity of CGS, used to take to task very senior officers on various issues. Many point him out as a staunch loyalist to Gen Pervez Musharraf but I see him as adhering more to orthodox military discipline. I envisioned a possible civil war between good forces led by Gen Tariq Majeed and bad forces led by Gen Pervez Musharraf. I thought that this would lead to Armageddon as discussed in this post. Nothing happened except that I ended up in hospital in Aug 2005. I thought that Gen Musharraf clipped his wings by appointing him on largely ceremonial appointment of CJCSC. While Prime Minister has extended the tenure of COAS Gen Ashfaq Pervez Kayani on advice of the President, it will be interesting to see whether Gen Tariq Majeed gets an extension. Gen Tariq Majeed has recently expressed his opinion that he did not have the desire of getting an extension. I think it is the job of the reader to separate delusions from facts and opinions. Specifically the list of officers and the Indian spy is not a delusion. If someone is inclined he can investigate on his own. I am shocked after reading about the Indian spy incident and the list of officers. This single incident was most responsible for my disease. Had it not happened i had gone undiagnosed. It is an open secret within Army. Do you know that General Ameer Faisal was killed by his colleagues.